The Classroom Program has been busy onboarding instructors for the fall term. The fall marks the second half of the Year of Science, and continues Wiki Ed’s trend of growth. We’ve nearly doubled the number of supported courses compared to this time last fall. 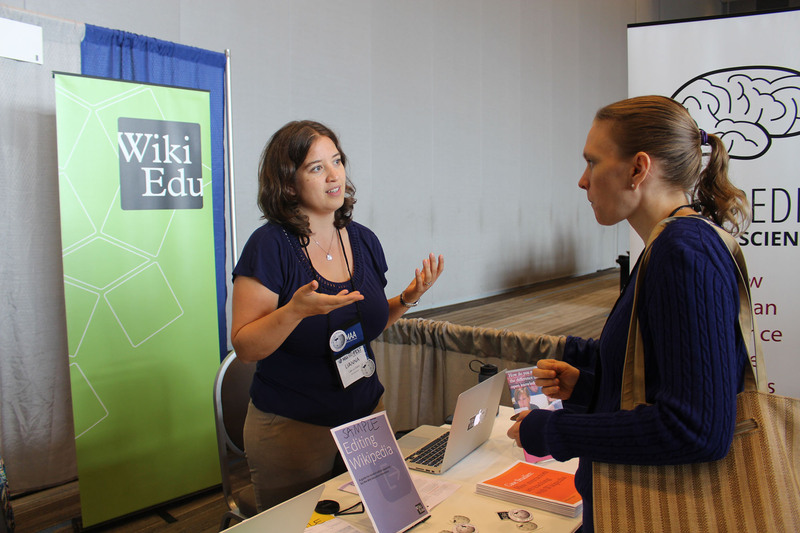 Wiki Ed staff was on the road in August, promoting the Year of Science with instructors at the Joint Statistics meeting, MathFest, the Ecological Society of America, and American Chemical Society events. These events create an environment for face-to-face contact with experts in the sciences, and provide an opportunity to raise awareness among the scientific community. We’ve opened new Visiting Scholars positions: Brown University, which focuses on ethnic studies, and Temple University, which is seeking to contribute to the improvement of articles about Philadelphia history and/or the Holocaust. Wiki Ed has produced a new subject-specific brochure for students developing Wikipedia content on topics related to linguistics. The guide is a nod to our partnership with the Linguistics Society of America, and discusses scaffolds and frameworks for articles related to dialects and concepts in linguistics. Wiki Ed’s Student Learning Outcomes research project’s surveys were approved by the University of Massachusetts Amherst’s Human Subjects Research Protection Office and Internal Review Board. These voluntary surveys were distributed to students via the Wiki Ed Dashboard, and will form the core of Research Fellow Zach McDowell’s analysis. 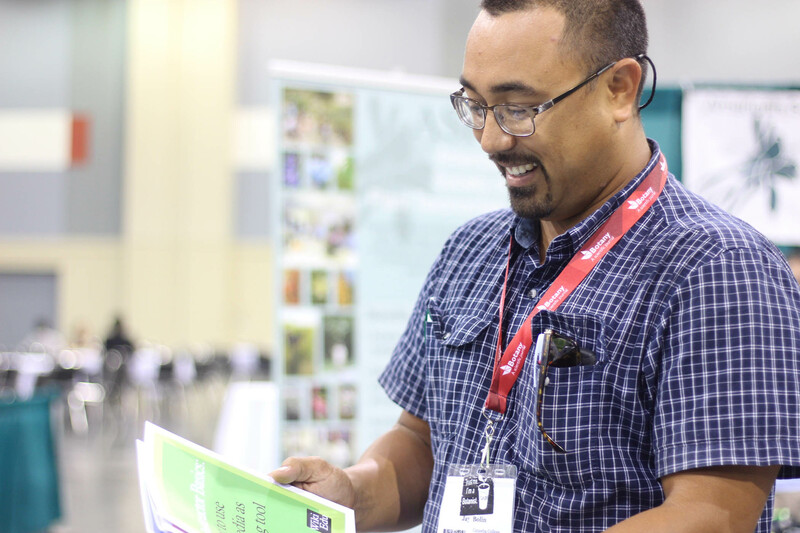 An instructor at the Botany 2016 Conference in Savannah, Georgia learns more about Wikipedia as a teaching tool. August was a busy month for the Educational Partnerships team. 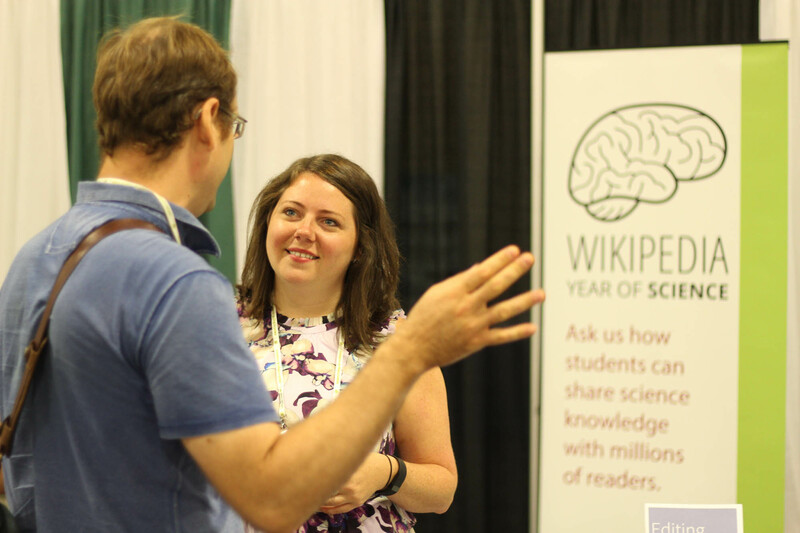 Staff traveled to several academic conferences to promote the Wikipedia Year of Science. Educational Partnerships Manager Jami Mathewson attended the Botanical Society of America’s annual meeting in Savannah, Georgia, where she spoke with botanists about plant physiology and taxonomy. While there, she talked to instructors about the role their students can play in improving Wikipedia articles related to the plants they study. Director of Programs LiAnna Davis speaks to a MathFest 2016 attendee. Outreach Manager Samantha Erickson attended the Joint Statistics Meeting in Chicago. This visit focused on increasing communication skills in students through Wikipedia, encouraging instructors to see the role our assignments have in elevating the public understanding of statistical concepts. Director of Programs LiAnna Davis joined Jami at MathFest in Columbus, Ohio. Math instructors expressed an increased interest in Wikipedia writing assignments, based on the communication experience they provide. Students need to develop communication skills during their studies. Math departments want to help their students be more competitive when they enter the workforce. A Wikipedia assignment is an excellent fit, since math articles on Wikipedia, though often accurate, are difficult for laypeople to comprehend. When students translate that content and make it accessible to the general public, they build skills otherwise overlooked in the math classroom. Educational Partnerships Manager Jami Mathewson speaks with an attendee at the Ecological Society of America conference. Jami and Samantha went to Fort Lauderdale for the Ecological Society of America conference. There, instructors and students alike were interested in Wiki Ed’s Ecology handbook, which aids ecologists and experts in editing Wikipedia. Wrapping up the month of travel and outreach, Jami attended the American Chemical Society’s fall meeting in Philadelphia, PA. There, she presented to attendees about using Wikipedia as a pedagogical tool in the chemistry classroom. She also joined the Simons Foundation’s edit-a-thon, where participants learned how to contribute and focused on articles about chemistry or women chemists. Students edited 32 articles and created 2 new entries. The Fall 2016 term has started, and we’re well on our way to supporting our largest number of classes to date. This time last year, Wiki Ed had 86 courses in progress, compared to 138 this term. In Fall 2015 as a whole, we supported 162 courses, just 24 more than where we stand today, with the fall term yet to begin. This growth is due in large part to our outreach team and to our ability to provide instructors and students with meaningful learning experiences. As the Fall term begins, we’re also entering the second half of the Year of Science. So far for Fall 2016, we have 82 courses in STEM and social science fields, and we anticipate many more to come on board as the term progresses. In Spring and Summer 2016, we supported 130 courses and over 2,300 students during this year-long initiative to improve science content on Wikipedia and science literacy and communication among our students. Our Year of Science courses have ranged from genetics to archaeology and from sociology to plant biology. With a half year still to go, our students have already made a significant impact on Wikipedia. They’ve added over 2.3 million words, edited over 2,300 articles, and created almost 200 new entries. We’re excited to see what the second half of the Year of Science brings! Tamarins are small monkeys found in Central and South American. The black tamarin, one of the smallest primates, is found exclusively in northeastern Brazil where it is threatened by habitat destruction. At the start of the summer, the Wikipedia article on the black tamarin was a two-sentence stub. Students in Nancy Clum’s Biology 124 BKclass spend the summer expanding the article. They added a section describing the species, and others about its distribution, behavior, feeding, reproduction, and conservation status. And in so doing, they turned a stub into an informative article. Kathryn Grafton’s course from the University of British Columbia took advantage of the shorter term length in the summer to investigate a specific kind of content gap: omissions in articles themselves. Students looked at articles related to knowledge mobilization, a term describing how research is or could be brought out of academia and into public use. Students looked at research, knowledge mobilizations and scholarly analysis, highlighting where Wikipedia did not include important, relevant information, often from outside the west. Because all our student editors are wikipedians, they didn’t stop with criticism and have proposed changes with sources from their research for each article! Community Engagement Manager Ryan McGrady is focused on recruiting experienced Wikipedians for the open positions. He also continued to work with several other sponsors at various stages of the onboarding process and new contacts thanks to Jami and Samantha’s outreach at recent conferences. Communications Manager Eryk Salvaggio worked with Product Manager for Digital Services Sage Ross to organize a touchup of the Wiki Education Foundation’s website. The new site encourages deeper reads for specific audiences with visual cues directing readers to the blog, teaching resources, and fundraising pages. In August, we also announced publication of a new subject-specific brochure, Editing Wikipedia articles on Linguistics. The guide was written with input from Dr. Gretchen McCulloch and Wikipedia editors User:Cnilep, User:Uanfala, and our own Wikipedia Content Expert in Humanities, Adam Hyland. It takes student editors through the process of writing or improving Wikipedia articles, with templates for structuring articles on languages, dialects, and linguistic concepts. Eryk worked with Wikipedia Content Expert in the Sciences Ian Ramjohn to complete some updating of our training modules for students and the instructors’ orientation. With the Fall term ramping up, Sage spent much of August fixing bugs in the course creation and course cloning features, adding Dashboard features that make it easier for Wiki Ed staff to onboard and monitor new courses, and updating the Dashboard survey functionality for UMass Amherst’s Internal Review Board’s requirements for the Student Learning Outcomes Research. Work also continues on making the Dashboard codebase easier for new developers to get started. The ‘Overview’ tab of each course now shows the number of images uploaded. In August, Data Science Intern Kevin Schiroo analyzed the portion of academic content produced by Wiki Ed students. This came in two parts. First, Kevin uncovered and incorporated new “signals” within an article that identified it was related to academic content. That classifier pulled information from references, introduction text, templates, and the use of academic words to classify articles as academic or not academic with a high degree of accuracy. After constructing the classifier tool, Kevin applied it to a sample of Wikipedia pages to calculate the total productivity of Wiki Ed students within topics deemed academic. Percent of general academic content contributed by Wiki Ed student editors. When we consider all academic content, we saw some substantial contribution rates. Over the spring term, Wiki Ed student editors averaged 2.6% of all content. However, the entire term can be misleading, since we do not expect significant contributions early in the term, when most classes aren’t active. Shortening the window to 30 days shows that we produced 4.6% of all content between mid-April and mid-May. Percent of early-stage academic content contributed by Wiki Ed student editors. We also examined contribution rates for early academic content, since this is a focal area for Wiki Ed. Here, we see substantially higher contribution rates. Over the whole term last term, Wiki Ed’s student editors produced 6.6% of this content; during our most active period (between mid-April and mid-May) we produced 10.1% of all early academic content, that is, either new articles or articles that were in a fledgling stage of development when students first encountered them. Details can be found on meta and a general overview is available on Wiki Ed’s website. The Human Subjects Research Protection Office / IRB at the University of Massachusetts Amherst approved the protocol titled “Student Learning Outcomes using Wikipedia Based Assignments,” in just three weeks from submission. Research Fellow Zach McDowell worked with experts from various fields (particularly, Information Literacy and Composition and Rhetoric) that have taught with Wikipedia-based assignments to refine the survey’s assessments. Zach constructed the initial assessment and survey tool on the Wiki Ed Dashboard, engaged the Wiki Ed in a round of testing and feedback, and implemented those changes. Additionally, Zach gathered valuable feedback from board members, helping to further improve and shape the research questionnaires. These changes were re-submitted to IRB and approved. Helaine, Eryk, and Zach worked on refining a communications strategy to instructors and students, including a script for an introductory video for the research project, which will be shown to students before they are provided with a consent form. Final approval for this phase of the project was received in late August. The survey has been released, with emails sent in waves to students and instructors that had already on-boarded. These emails are sent out multiple times a week to students and instructors as they sign up for classes, informing them of the study and encouraging them to participate. 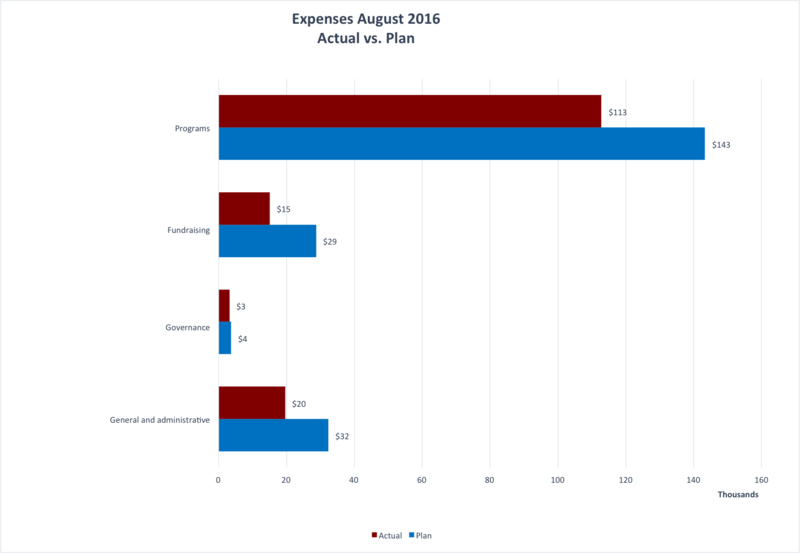 Monthly expenses for the Wiki Education Foundation in August 2016. 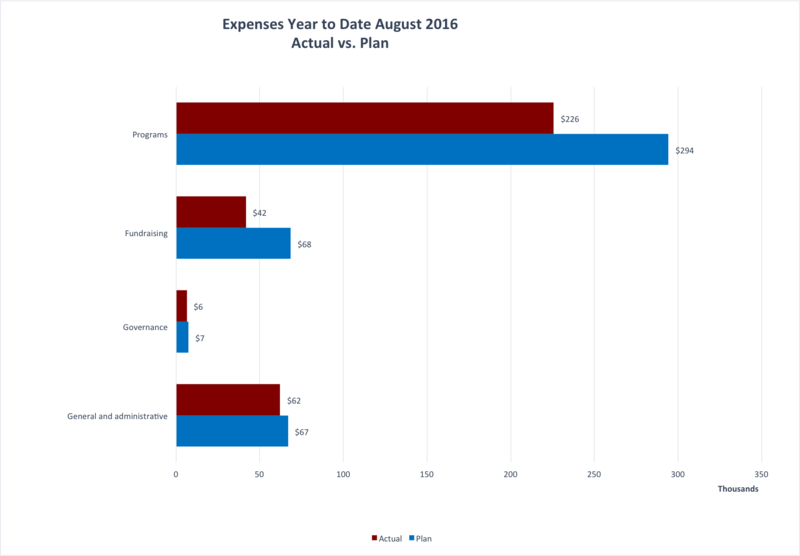 For the month of August, expenses were $150,664 versus our planned spending of $208,033. The variance of $57k was primarily due to the departure and vacancy of two staff positions ($21k), as well as some cutbacks and savings with travel ($26k) expenses. Year to Date expenses for the Wiki Education Foundation as of August 2016. Our year-to-date expenses are $335,774 versus our planned expenditures of $436,676. Along with the staff vacancies and cutbacks in travel mentioned above, the $101k variance is also a result of deferring our fundraising and marketing campaigns ($49k) until later in the year. In August, Executive Director Frank Schulenburg started the “Executive Director’s Major Gift Campaign,” reaching out to high net-worth individuals via personalized solicitation letters, followed by phone calls with prospects. The goal of this new initiative is to measure the effectiveness of an in-house mail campaign based on a highly-curated list of contacts. Also, using A/B-testing, we’ll be comparing the results of using different messages and the return from different target groups. Inspired by the #100wikidays challenge, we’re aiming at sending 100 letters in 100 days. Frank began preparing for the upcoming strategic planning exercise. With our current strategic plan running out in 2017, Frank and the board will create a new strategy for the next two years. In preparation for the kick-off, Frank started drafting a process and gathered materials for distribution among the participants of the planning exercise. Finally, Frank and the members of the senior leadership team used the first iteration of the new “Executive Director’s Summary Report” which aims at increasing our effectiveness in keeping track of organizational performance indicators on a monthly level. Based on the feedback received this month, we’ll further improve the usefulness of the report card in future iterations.